Mr. Mulvaney, in his letter, said domestic spending at the levels Congress authorized would add too much to the federal deficit. Yet for all of the talk of fiscal restraint, Mr. Trump’s budget also amounted to an institutional surrender to the free-spending ways of Capitol Hill, which Mr. Mulvaney said had surprised the president and prompted him to refrain from even bothering to advocate deficit reduction. Mr. Trump’s plan could easily result in much larger federal deficits. The administration made its calculations using assumptions about the United States’ economic trajectory that are more optimistic than the consensus among private-sector forecasters, or the assumptions used by other parts of the government. The assumptions in Monday’s release are also significantly more optimistic than the Trump administration itself used in its budget calculations last year. 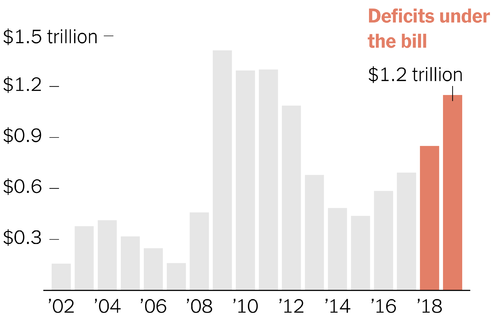 The centerpiece of Mr. Trump’s budget is a plan to devote $200 billion over the next decade in new spending to improve the country’s crumbling infrastructure, starting with $44.6 billion in 2019. The president says the plan will generate as much as $1.5 trillion to $1.7 trillion in new investments in building roads, bridges and other major projects over the next 10 years, in large part relying on states, cities and private companies to fund them. But the proposal faces steep challenges in Congress, where many lawmakers believe $200 billion is far too little to create a sustainable stream of federal infrastructure money for the future. Still, the budget compensates for the new infusion of infrastructure spending in part by slashing existing transportation programs, which would be cut by $178 billion over a decade, according to a detailed budget breakdown the Trump administration sent Monday to Capitol Hill. Grants to Amtrak would be halved, from $1.2 trillion to $538 billion, while the Army Corps of Engineers, which manages vast amounts of public infrastructure projects, would see a more than 20 percent cut. Lawmakers in both parties, who essentially went around Mr. Trump to strike their own budget compromise, made it clear they had no intention of embracing Mr. Trump’s plan. Representative Kevin Cramer, Republican of North Dakota, denounced “drastic cuts” to the federal crop insurance program, calling them “ill advised.” Representative Ed Royce, Republican of California and the chairman of the Foreign Affairs Committee, said lawmakers in both parties would once again reject the president’s “deep cuts” to the State Department and foreign aid. Democrats dismissed Mr. Trump’s proposal on Monday as a far-fetched plan full of misplaced priorities. “While the president and his O.M.B. director live in budget fantasyland, I will be in the real world negotiating a responsible, bipartisan appropriations package that invests in American families and communities,” remarked Representative Nita M. Lowey, Democrat of New York and the ranking member of the Appropriations Committee. “It is utterly astounding that just six weeks after slashing taxes on the wealthy and biggest corporations, creating a huge deficit, the president asks older Americans and middle-class Americans to make up the difference by slashing Medicare and Medicaid,” said Senator Chuck Schumer, Democrat of New York and the minority leader. Mr. Trump’s plan would also allocate $13 billion in new spending to tackle opioid abuse through prevention, treatment and recovery support services as well as mental health programs. The president is also pressing forward with plans to slash funding for the Environmental Protection Agency, despite Congress’s rejection of a similar plan last year. The budget blueprint would pare the agency by $2.8 billion, or 34 percent from its current level, while eliminating virtually all climate change-related programs. It would also cut the agency’s Office of Science and Technology nearly in half, to $489 million from its current $762 million. In outlining the budget, the Trump administration said E.P.A. is refocusing on what it called “core activities” and eliminating “lower priority programs.” That list includes a program to promote partnerships with the private sector to tackle climate change; environmental education training; and an effort to protect marine estuaries.